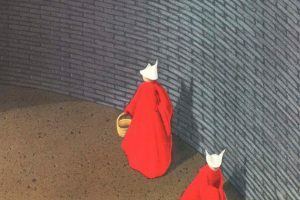 Margaret Atwood’s dystopian tale, portraying a puritanical theocracy in America, is now a television series on Hulu. Kyle Willoughby and Claire White discuss this latest adaptation of the popular book. Claire begins with a focus on the modern tyranny of totalitarian governments, particularly in 20th century eastern Europe. She explains why the creation of an authoritarian state can be dismayingly hard to predict, and why the hope that “it can’t happen here” depends on changeable circumstances. Kyle gives some background on Atwood’s life and career, before describing the process of adapting the novel with show runner Bruce Miller. Our hosts conclude with their thoughts on the show, the book, and which literary dystopia they would live in (if they had to).